Our goal was to show photo viewers the product and employee simultaneously. One snag: The giant turbine was too large to move and the area behind it was busy and distracting. We took the photo standing on a ladder, which allowed us to shoot down on the employee and simplify the image and background. This employee portrait was lit with three lights. The main light is a five-foot Octabox, which provides a soft, diffused output that evenly covers the employee with a gorgeous wash of light. We placed the Octabox high above the employee and angled it down. Two Speedlight units provided secondary lighting and bursts of colors from orange and blue gels. 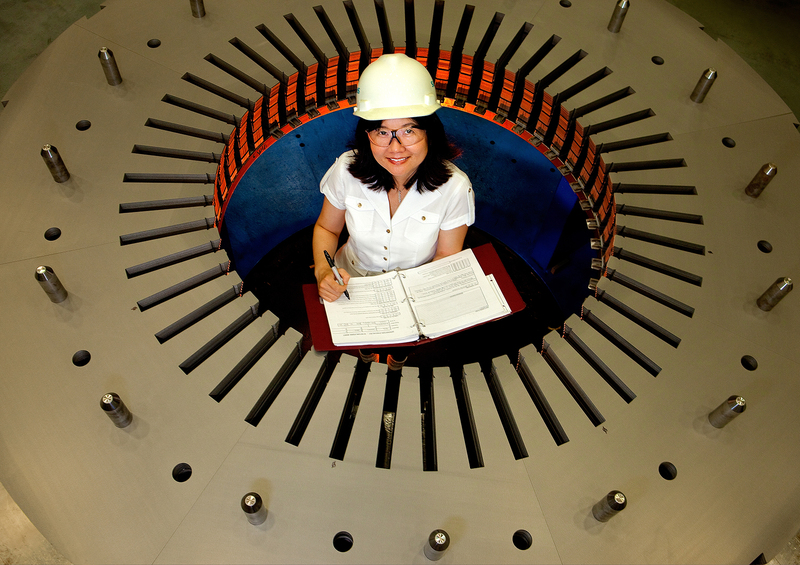 The colors help separate the employee from the monotone turbine while also pulling in viewer attention.